LUMPENPROLETARIAT—This movie is a dignified tear-jerker, certainly, with some moving speeches delivered with stirring emotion by a fine cast. We recommend it. 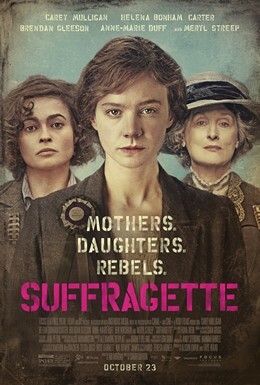 Also, Suffragette, in its depiction of female solidarity in the face of patriarchal repression, offers an important feminist perspective often lacking in contemporary dominant culture. Of course, we could cite many deficiencies in the film, as a snap-shot of working class struggle, such as the role of organised labour. Yet, families may enjoy and benefit from this film at a theatre nearby. If so, families may discuss these themes to enrich our collective social awareness. The consensus at Rotten Tomatoes offers: Suffragette dramatizes an important—and still painfully relevant—fact-based story with more than enough craft and sincerity to overcome its flaws. This is important history in the lives of working class people, which can only benefit younger generations finding their roles within the capitalist mode of production.